My friend Jocelyn told me about this folk art painting, Acupuncture Pitchfork Style, by John William "Uncle Jack" Dey, which hangs in the Smithsonian American Art Museum (click here for a larger image of the piece). 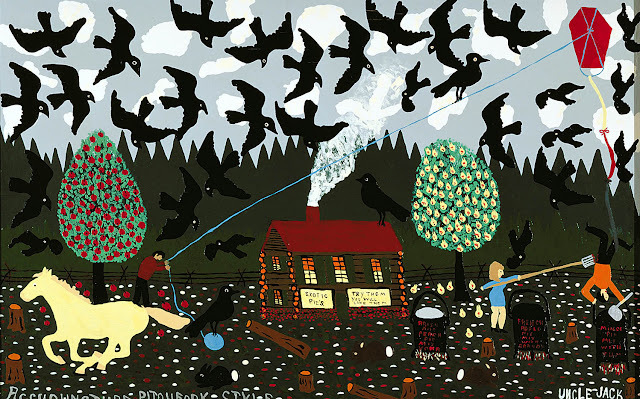 It depicts a bizarre scene where crows or blackbirds (four and twenty, perhaps?) hover over an attempted pie theft by kite! A woman in a blue dress, evidently the vendor of these "exotic pies" ("try them you will like them"), uses a pitchfork to defend her threatened pie mixes which include raisin rum peach, French apple, and mince with rum. Yum. Uncle Jack was born in Phoebus, Virginia in 1912, and painted this work with model airplane enamel on wood in 1974. The inspiration for the piece apparently came from memories of Maine, where Dey worked as a trapper and logger, combined with his vast imagination. The painting reminds me of this photograph of Bill Carter Mug Baker's weird pie shack as well as a time when I stopped for one of "Priscilla's pies" at a house on the side of the road in Maine. I didn't meet Priscilla, (only her husband), but I imagine she looked a little like the woman in a blue dress, and might have even poked you with a pitchfork if you attempted to steal her desserts. I must admit, I have not yet visited Uncle Dey's painting at the art museum, but perhaps I'll make a pilgrimage to view this exotic pie scene this weekend.